50 metres from the beach in Denham…. are Wildsights Villas, a collection of private, cavity brick and tiled roof villas that are spacious, spotless, central, cheery, inviting, fully self contained, self-catering and only 15 minutes drive from Monkey Mia. 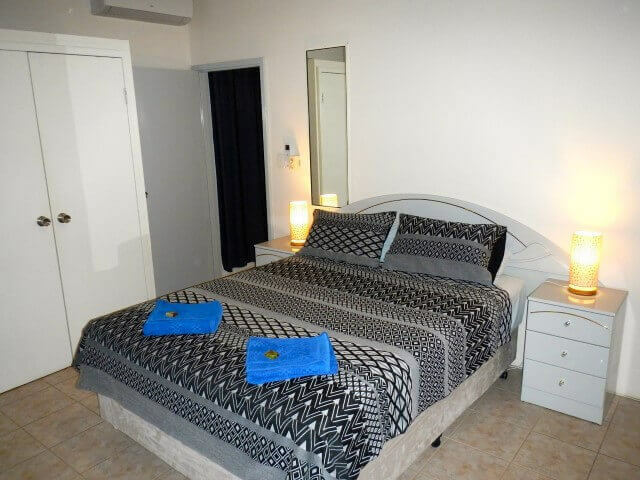 The “Villas” are a recent addition to the Wildsights group of businesses, established in Shark Bay in 1993, which also operates other accommodation as well as tours, cruises and an activity booking service. For more information please go to the official website of Wildsights Villas. Situated in Durlacher Street, just 30 metres from the waterfront of Knight Terrace, the main street in central Denham. The Villas are the most centrally located, self-catering accommodation in Denham. Every facility is within a 300 metre short stroll along the waterfront and a glorious, safe beach is only 50 metres away. There is a comfort edge provided by the side street location off the Knight Terrace waterfront. Shark Bay’s southerlies are very reliable and vigorous, often making the south-facing foreshore untenable, whilst around the corner, in Durlacher Street, Villa guests are sheltered and free to enjoy their patio settings. There is limited on-site parking for boat trailers, particularly for big boats. If required, alternative parking will be provided 300 metres away at one of our sister properties which has ample parking with easy access. Just let us know at time of booking what your extra parking needs are and we'll take it from there. Walk across the street for a swim. Breathe the fresh sea air and enjoy a sundowner with your front row seat of glorious sunsets. Each Villa is fully equipped to be your home away from home, with TV, airconditioning, ceiling fan, linen (plus spares), crockery, cutlery, pots and pans. The builtin kitchen has a full size, 4 burner gas stove with grill and oven; a 240 litre fridge/freezer; microwave oven. Satellite digital TV provides access to over 40 channels Australia-wide. The Villas’ floors are full tiled throughout to facilitate thorough cleaning. Each Villa is fully insect screened, airconditioned and has ceiling fans. Each has its own patio, complete with outdoor setting of table and chairs. Each has its own laundry and private clothes drying courtyard.